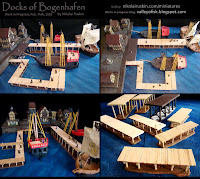 Here are a few Morheim style ruined buildings I am working on to add to the Bogenhafen Layout. 1. Roof Shingles are now made from a thin wood veneer. I cut them in to strips, stack the strips and use a mini-mitre saw to produce them. This gives the shingles a meatier look, plus I can snap them on the fly if I need to fill gaps. 2. Tight Bases: I am now cutting the bases of each building to the exact contour of the footprint (or as close as possible). I noticed in a recent game that we had trouble positioning a model on a corner due to the base sticking out about 1 cm, so I am going to eliminate the excess base material. 3. Banisters / Railings: I have developed a fast technique for railings and banisters. The bottom is foam core, with toothpicks poked in to the foam edge, followed by 2 or three thin strips at the top. The slums of Bogenhafen are the aftermath of a brutal siege by the Axebite orc tribe. Fierce combat spilled through the North wall of the city and greenskins occupied the neighborhoods on the north side of the river Bogen for nearly three weeks before reinforcements from Altdorf finally arrived to drive the orcs back to their lair in the Grey Mountains. Efforts to rebuild these devastated areas have been slowed by the expansion of the docklands, leaving the majority of Bogenhafen’s peasantry homeless or living in squalid conditions of ruined homes. There have been numerous requests for relief aid sent to Emperor Karl Franz, but so far Altdorf has been slow to respond. These hills are designed for maximum battlefield efficiency! Each hill is made to last, mounted on beveled MDF bases, completely textured with sand and light gravel, painted in three shades of latex matte interior paint and flocked with some green stuff. 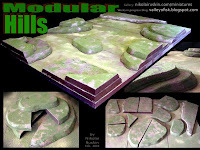 The hills were cut from pink polystyrene using a jigsaw set at an approximate 30 degree angle, beveled mdf bases ate at 45 degrees. The hills are attached to the mdf via hot glue; I used two hot glue guns simultaneously and you have to work quickly before the glue cools. The sand and gravel texture is applied by brushing out wood glue then sprinkling the sand over the hills. A roller was used to apply the first shade of dark brown then two lighter shades were dry brushed over the base coat. The flock is applied in the same manner as the sand; glue then sprinkle flock. A note on angle and texture: I kept the edges of the hills at a fairly sharp angle, as a gaming compromise. Low angle / gradually sloping hills look great, but are nearly impossible to balance miniatures on. I also kept large rocks and pebbles out of my texture so that hills would lay flat on each other when stacked. 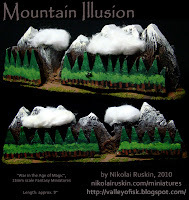 Terrain philosophy: I always balance game play with aesthetic value in my terrain pieces. 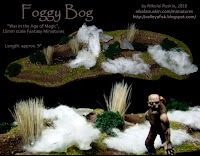 What makes for a great diorama does not always make for a playable piece of terrain that minis can be placed on. I also go for durability as this stuff gets a lot of use and tends to be clunked around during transport and set up. 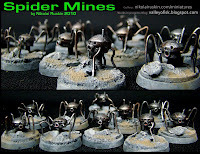 These Spider Mines were built on commission inspired by those pictured on the Combat Zone Chronicles site. Materials used: wood plug, steel wire, cylindrical shaped beads. I used a dremel tool to drill holes for the legs, eyes, and antennae, and super glue for all bonds. If you look closely you may see the black post supporting each Spider Mine from below. Ahh, styrofoam packing material; it has been years since I used this stuff as inspiration for a terrain piece (the SCI FI INDUSTRIAL JUNGLE). This is the beginning of a larger set which will include 4 building structures, 2 raised bridges and a walled courtyard. I'll be painting this up in the style of the Desert Badlands I finished recently. "IT BETTER BE DA BIGGEST FING IN DA CAMP!!!" This is the first stage of the Lair of Urktash Axebite, the biggest baddest Black Orc Warboss ever to roam the Grey Mountains!! 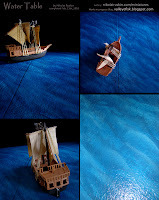 The Docks are coming along nicely, and I decided that a water table was needed to determine the color pallette before the docks (small ones) and piers (large ones)could be finished. I have built three piers (and five docks so far. There are a few more designs I may try in the next wave, but these will do for now. Once they are given the x bracing below and the deck has been scratched up for weathering, I'll be able to finish the painting.I will most likely add barnacles to all of them so that they hava an ocean look, even though Bogenhafen is a river town. Ropes are another detail I plan to add as well. The basic table sections are constructed with 2'x4' masonite, braced on a frame made of 1"x2" boards. They are heald together during game with two c clamps. These table sections were recycled; that is to say the original surface was done as a grassland board, textured with cat liter. I own 5 of these panels and don't often have a need for a 10' long table so I decided to scrape two of them down with a rasp to refurbish them as water tables. The original texture of the tables was reinforced with a thin layer of fine sand, primed with gesso, given a thick coat of black latex, then the final waves were painted using matte latex interior paints. After the colors were finished, the table was then sealed with Minwax acrylic gloss varnish. I don't own any 15mm models to shoot these pics with. That is a good thing; I have more minis than a sane person needs. 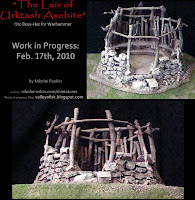 This is a shrine in 15mm for the game War in the Age of Magic. 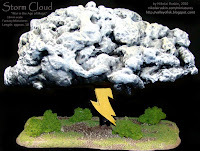 This Storm Cloud was made using a can of spray foam insulation, which is messy stuf!!! My first atempt was disastrous. I reccommend latex gloves and newspapers to help contain the mess. The foam was layered over a foam core piece, mounted on a wooden dowel. The lightning is also foam core. The cloud is painted with black matte Latex undercoat, then acrylics. 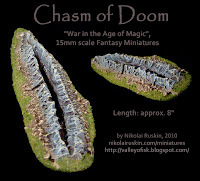 More terrain for the War in the Age of Magic 15mm fantasy miniatures game. This piece is the Chasm of Doom, in which unlucky troops may fall to their DOOM while atempting to cross. Made of Pink Foam and Masonite, painted with acrylics. 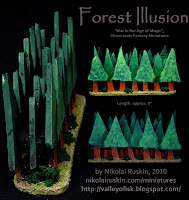 These are the Illusion Markers for War in the Age of Magic, a 15mm scale Fantasy miniatures game. The controlling player places three of these on existing terrain sections to indicate that they may be an illusion. 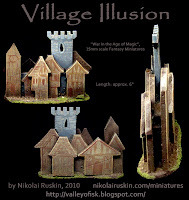 The Illusions are a set of three, made with foamcore, pink insulation foam, MDF and painted with acrylics. The cotton is used to represent clouds over a mountain range. The illusions are not really meant to be in 15mm scale, but a flat representation of something the soldiers might see off in the distance when viewd from their point of view on the table top. 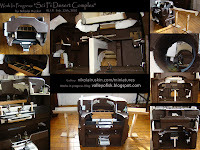 My goal was to create something that did not look quite real, to give it a flat quality befitting an illusion or mirage. The Graveyard is part of a 6 piece set I produced on commission inJanuary 2010, for the game War in the Age of Magic, a fantasy ruleset for 15mm miniatures.